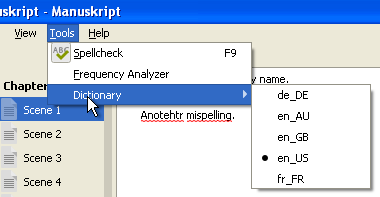 The spellcheck feature of manuskript is provided by the PyEnchant package. 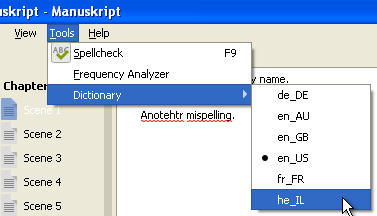 Additional language dictionaries can be added to Manuskript to enable spell check to work with other languages. Following are instructions to add dictionaries based on which Operating System you use. Identify the language code and install the dictionary package. su -c "dnf search aspell | grep -i spanish"
su -c "dnf install aspell-es"
Locate the desired language at the following link: LibreOffice dictionaries. Download the two files *.aff and *.dic for the desired language. For example for Hebrew there is the he_IL directory which contains the he_IL.aff and he_IL.dic files. Be sure to download the raw or plain content of the file. With a web browser right-click on plain and choose Save link as or Save target as. Copy these two files to the "manuskript/enchant/share/enchant/myspell/" directory where you unzipped manuskript. Now when you run manuskript.exe the Hebrew dictionaries are available under the Tools -> Dictionary menu. Follow the same process that is explained in the Windows section. Please make sure you downloaded plain versions of dictionary files. As the docs stated: With a web browser right-click on plain and choose Save link as or Save target as.